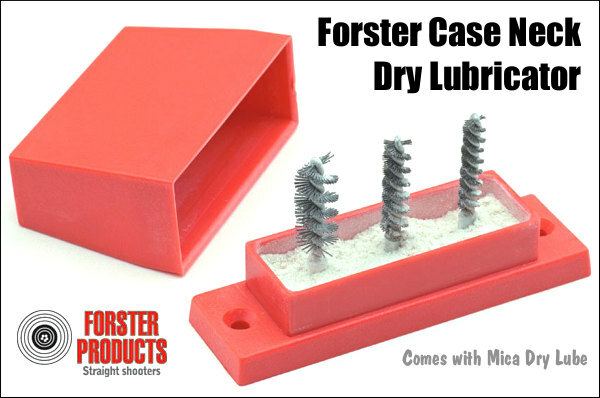 The Forster Case Neck Lubricator features three brushes attached to a tough, impact-resistant case with holes for bench mounting. The brushes accommodate all calibers from 22 to 35 caliber. The kit includes enough “motor mica” to process 2000 to 3000 cases and has a cover to keep dust and grit from contaminating the mica. By moving the case neck up and down on the correct mica-covered brush, the neck can be cleaned and lubricated at the same time. Share the post "For Smoother Bullet Seating — Try Dry Lube Inside Case Necks"